Mozart's Ave Verum performed by the Choir of St. John's College, Cambridge. When the jailer woke and saw that the prison doors were open, he drew his sword and was about to kill himself, supposing that the prisoners had escaped. But Paul cried with a loud voice, "Do not harm yourself, for we are all here." And the jailer called for lights and rushed in, and trembling with fear he fell down before Paul and Silas. And they spoke the word of the Lord to him and to all who were in his house. And he took them the same hour of the night and washed their wounds; and he was baptized at once, he and all his family. Richard Lovelace, a British poet, wrote: "Stone walls do not a prison make, Nor iron bars a cage", and it never applied more literally to anyone than Peter and Paul. They escape ambushes and prisons time after time. 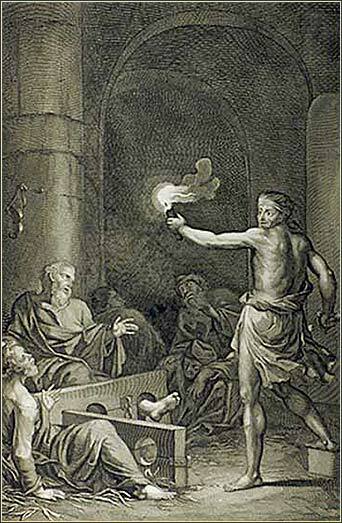 In Acts 5, an angel opens the doors of a prison in Jersusalem, releasing Peter and the other apostles; in Acts 9, Paul escapes Damacus by being lowered over the wall in a basket; in Acts 12, an angel releases Peter from Herod's prison and leads him out of the city gates past sleeping guards. In today's lesson, God simply smacks the prison with an earthquake. Of all the escapes, this one is the most symbolic. Christ promised that "the truth will set you free" (John 8:32) and likened his death to the destruction of the Temple. Paul and Silas' escape is a dramatic physical reminder of our spiritual release from the prison of sin. By the power of God and through their belief in Him, their earthly shackles fall away and the prison doors fall open. Fittingly, the prison guard who witnesses these events is converted in a rush, much like the scales fell from Paul's eyes; the door to salvation is opened to him just as those who heard Christ's words were freed. Both the apostles and their jailer are set free.